The Yucatan Peninsula has been touted as a safe, cost effective and enchanting place to live for some time now. If you are interested in what some of our friends from the north think about living and visiting the area you can read articles from Kiplinger and Readers Digest Canada about traveling and retiring here. Those of us who live here part time and year round know that travel back and forth from our family and friends up north to our new home is most effectively made via airplane. Mexico is a really big country and a road trip, though desirable for some, can take a toll on your vehicle and a big chunk of time. 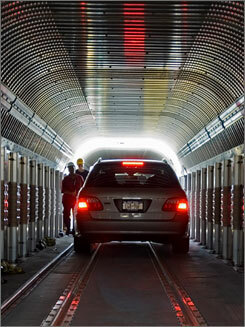 The benefits of traveling with your vehicle are great if you have the time and energy to do it. You will have a car to drive here in Mexico, for one. You also can bring more comforts of home along with you – like a nice little stockpile of your favorite foods and beauty care products you just can’t find here. The fees for extra baggage are not always cost effective when it comes to bringing things back to Mexico and you can only fit so much into the overhead bin of an average airplane. So what if you had another option? What if you could pack your car on a ferry in, say, Tampa Bay, Florida and travel by sea to Progreso, Yucatan? The trip from locations on the eastern seaboard of the US would be even more relaxing if you board the Amtrak train service called the “Auto Train” from Lorton, Virginia to Sanford, Florida- saving over 900 miles of driving. The service even allows for SUVs and minivans. That would be a dream right? Maybe this is not a dream. A company called United Caribbean Lines is currently in negotiations with Mexican and US government officials to make a ferry I have just described a possibility. There is a lot of work involved in a venture like this so it is not surprising that an initial expected launch date of 2011 is not in the cards. There is a strong possibility, however, that we can expect to see service start sometime in 2012. We hear from local expatriates involved in this process that a launch date and web site will be announced as soon as negotiations indicate the service is viable, marketable and sustainable. If you would like to be a part of this process you can indicate your interest in a Progreso, Yucatan-Tampa Bay, Florida ferry service by completing a survey. If you live six or more months a year in Mexico or any other country in Central or South America please follow this link and complete the Survey entitled Expatriate Ferry Survey. If the link doesn’t work please copy and paste it into your browser. If you travel back and forth or live less than 6 months of each year in Mexico or any other country in Central or South America please follow this link and complete the Survey entitled Snow Bird Ferry Survey. If the link doesn’t work please copy and paste it into your browser. Both surveys will be open until September 16th so please respond as quickly as possible. Please feel free to forward this email to anyone else you think should complete the surveys. Thank you in advance for your participation. We look forward to your responses. 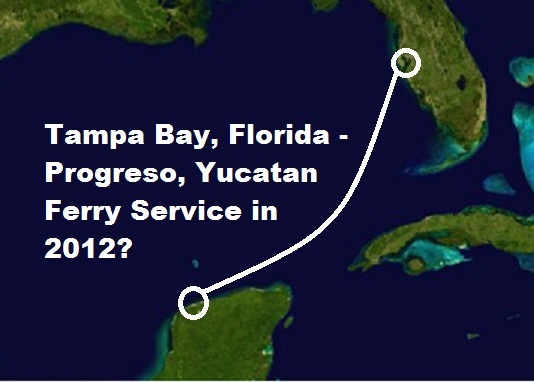 On a side note- this is not the first attempt to bring ferry service to the Yucatan Peninsula from Florida. The “Yucatan Express,” a ferry that spent summers in the US state of Maine, had service to Progreso in the winter of 2003 but did not continue due to a lack of travelers. If you have interest in learning more about the details surrounding boat service between Progreso and Florida (cost, length of the trip, options for container shipping between the two locations, etc.) please read an article on the topic from Yucatan-Life.com here. We will do everything we can to keep you updated on this potential new service as we receive new information. In the meantime- let us know how you travel back and forth between your home in Mexico and your home up north. Would you take a ferry if it was available to you? What would make a ferry service like this more valuable to you? You can comment below or on our Facebook page or Twitter feed. My Husband and I frequently fly to Merida and visit other areas also. The ferry would be so wonderful. We used THE YUCATAN EXPRESS and was enjoyable and was sorry it did not continue. Hoping this venture will come to completion in 2012! We used the Yucatan Express and Loved it.We are now living in Tlaquepaque,Mex.We own a home in Florida and I can assure you if the Ferry was operating we would be living in Merida.We are hoping ,hoping hoping that this becomes a reality! I’m living in Venice FL. My Girlfriend and I want to move part-time to the Progreso area. We have been anxiously awaiting a possible ferry service! I am totally ready for this . I hope that there is enough interest in this for it to become a reality…………….like soon !!!. I’m all in with this idea. I have family in the Yucatan that we rarely visit. being able to drive once there would be a bonus. Oaxaca, tulum, chichen itza. sweet! This is the safest and friendliest part of Mexico. If you’ve never been, please talk to people who have before you go. It is different and not for the less adventurous. You have to be patient and not afraid to rough it occasionally. But rest assured it is totally worth it. The food alone is worth the expense of the trip! please keep me up to date regarding the Tampa to Progresso ferry…. this sounds terrific to us…..
We’re totally ready to go to Yucatan and anxiously awaiting word on the ferry. We lived several years in Lake Chapala area of Mexico and visited Progreso and decided that is where we wish to retire so anxiously await word of the ferry. We own homes in Central Florida as well. will it every become reallity? i have heard that there are plans for a ferry from Tampa to Playa del Carmen. My husband and I and our dog Eli would love to see the ferry become a reality. This will be a great way to get to our home in Progreso!! !